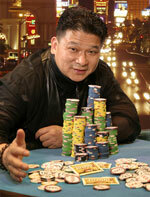 Chan was the first Asian to be inducted into the Poker Hall of Fame (2002). He has won ten gold bracelets, an honor that is only held by two other players: Doyle Brunson and Phil Hellmuth. His greatest distinction, however, is winning back to back world championships in 1987 and 1988, something only one other player, Doyle Brunson, was able to do. He almost won it a third time in 1989, but ended up coming in second to Phil Hellmuth. Jerry Buss, an avid poker player and owner of the Los Angeles Lakers, promised Chan an NBA championship ring if he could win three in a row. Chan is originally from Canton, China, but has moved around quite a bit since then. In 1962, he and his family moved to Hong Kong. Then in 1968, they moved to Phoenix, Arizona; and then to Houston, Texas, in 1973 and started up a Chinese food restaurant. He picked up English as he went along in school and hung out at the local bowing alley where he soon became quite good. It was there he discovered poker, developed great passion for the game and made history. He started out in small games, which grew in size, playing in the basement of the family restaurant. At the age of 16, he snuck into a casino in Las Vegas to play cards, after turning $500 into $20,000 in one day he promptly lost it all the very next night. That seemed to cool his poker ambitions for a time. He went on to college, however at the age of 21, he decided to go ‘all in’ and Johnny Chan dropped out of the University of Houston to become a professional gambler in Las Vegas. In his early years, he had his share of rough spots, winning big then loosing big, working from time to time at 'real jobs' to help support his poker play. He also had a bit of a temper and that seemed to affect his game quite a bit, often getting over emotional and clouding his better judgment. In 1982, his game really started to improve. He quit smoking and took better care of himself physically. He was playing in The America’s Cup of Poker in Las Vegas and knocked out 13 of 16 players in just over 30 minutes. It was then that Bob Stupak gave him the nickname of “The Orient Express”. As Chan describes it: "Not too many players try to bluff me. If there's any bluffing or stealing, I'm going to be the one doing it." Johnny Chan has gone on to be one of the world’s greatest tournament poker players winning almost $4 million at WSOP events alone. Chan is also famous for making a cameo appearance in the popular poker movie, "Rounders", staring Matt Damon. The movie referred to Chan as the best poker player in the world, and to be sure, one can’t ignore his accomplishments. Chan has earned over $8.6 million in live tournament winnings. Johnny is known for keeping an orange in front of him during tournaments. Some say it is for luck, but Johnny is quoted as saying that he likes the smell and that it combats the smell of cigarette smoke that is common at many tournaments. Johnny is also a savvy businessman, owning a fast-food restaurant in the Las Vegas Stratosphere Hotel and consulting for casinos and game makers. 2005, he won his 10th WSOP gold bracelet! Also during this year collaborated with Mark Karowe to release Play Poker Like Johnny Chan, an instructional book on several different types of poker. In 1987, he won the WSOP Main Event. Through 2006, Chan has won $3,744,331 at the World Series of Poker.